Rainbow Honey has done it again. Their newest collection - The FAB Summer collection is stunning. Three fabulous shades that are perfect for fun in the sun. I received this collection to review and share with you. Rainbow Honey listened when their customers spoke. The formula is wonderful on these polishes and the shimmer and shine is gorgeous! 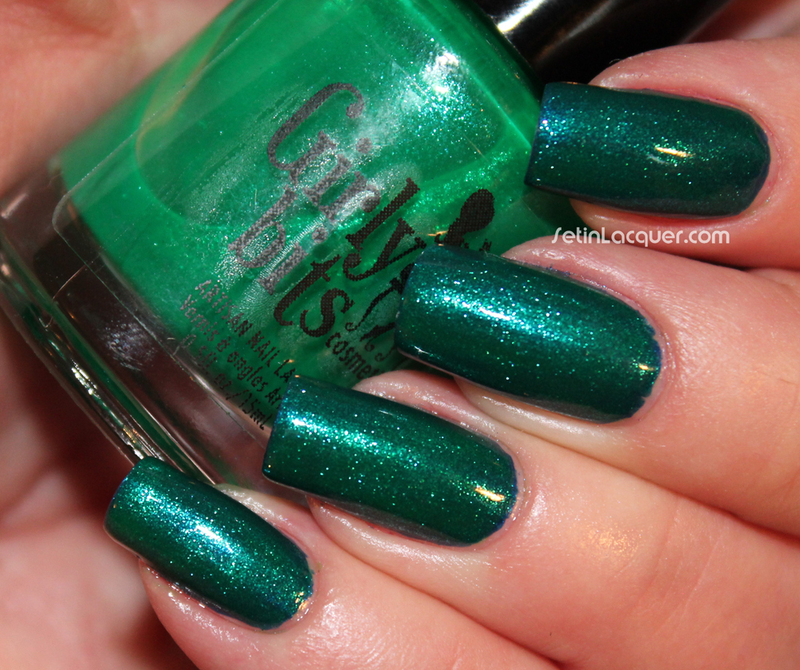 Tenda is a bright kelly green lacquer with golden shimmer. This is two coats. Costa del sol is a shimmery lacquer full of iridescent and holographic glitters ready to add some sun and sparkle to your manicure. This is one coat over Schrammi. 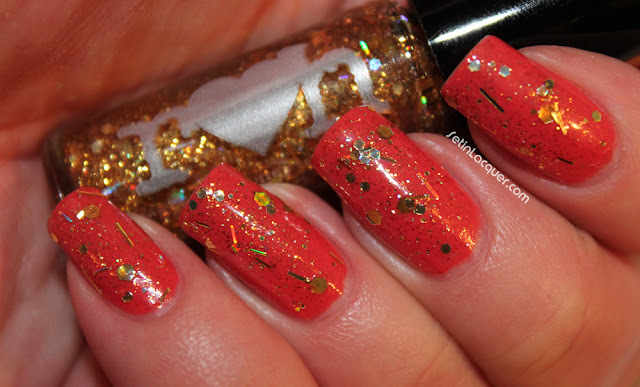 Schrammi is a deep coral lacquer with golden shimmer. This is two coats. It is the favorite of the collection for me. I love this deep coral shade. This is two coats. 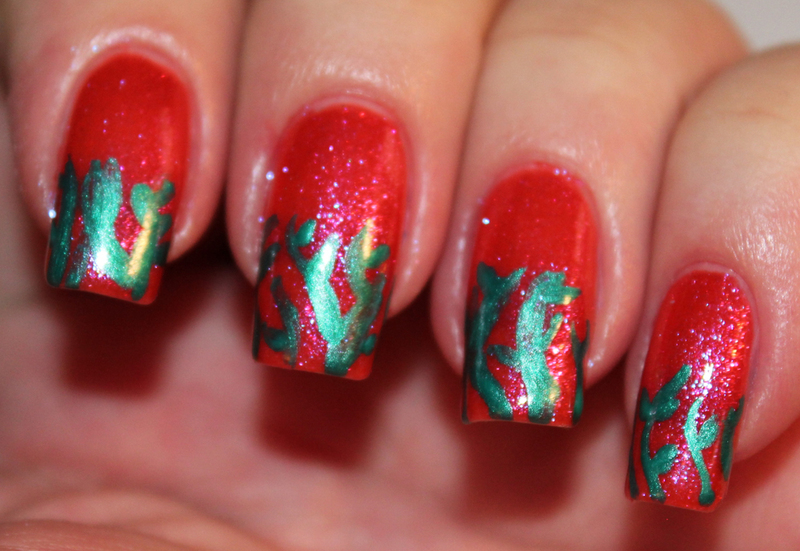 So I am comparing Nail Venturous Floam to Salon Perfect Kaboom for you. Let's just jump right to the photos. Here is a bottle shot of both. You can see that Kaboom looks slightly more green than Floam. You can tell the difference on the nail. But the difference is not that great. Floam is slightly bluer than Kaboom. Both polishes are shown over Sinful Colors Unicorn. I used two coats of each. What do you think? The difference is slight except for the price. The price for Kaboom is $3.98 at Walmart. I found Nail Venturous on wanelo.com for $14.99. Salon Perfect was provided to me for an honest review. Nail Venturous was a gift. 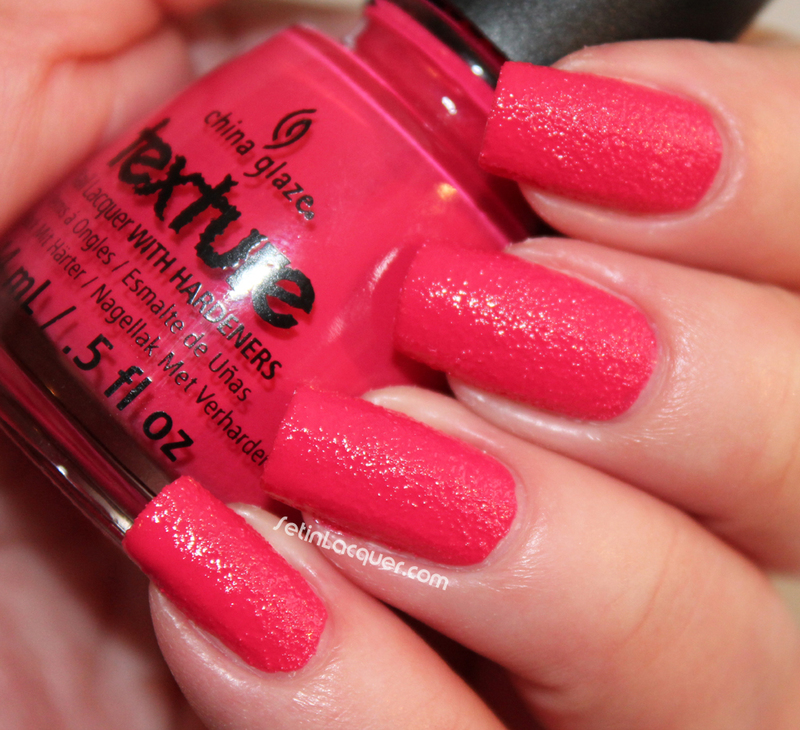 I have some amazing neon, matte polishes to share with you today. Introducing Salon Perfect® Neon Collision for Summer 2013. Salon Perfect was gracious enough to provide me with three polishes from their new collection. When you mash up two of this summer’s hottest nail trends: neons and matte glitters you get an energizing burst of color from the new Salon Perfect® Neon Collision nail polish collection! Salon Perfect® floats neon matte fine glitter in a clear base to create this “can’t-not-look” collection of six eye-catching shades that offer complete coverage in 2-3 coats. Or give nails a blast of nail art by using any Salon Perfect® Neon Collision shade as a one-coat layering polish or use it by itself to get that textured look. The formula on these polish was easy to work with. The matte glitters applied evenly and laid flat against the nail. The dry time was pretty decent. I like the look - especially layered over another polish. Let's take a look. I have layered these swatches over various colors and used them alone. The only thing I don't like about using glitters alone is that I can't get a clean line around the edges. Bang – is an orange and yellow collision. There are a few glitters of a pinkish color that simply adds to the overall look. On the index finger I layered it over Zoya Purity; the middle finger is over Sinful Colors Unicorn; the ring finger is layered over Venique Orange Strap Wedges; and the pinky is three coats of Bang by itself. Kaboom – is a turquoise and yellow collision. I like this color a lot. Especially on the middle finger. On the index finger I layered it over Zoya Purity; the middle finger is over Venique Give a Girl a Heel Breaker; the ring finger is layered over Sinful Colors Unicorn; and the pinky is three coats of Kaboom by itself. Exploded – is a reddish orange and yellow collision. 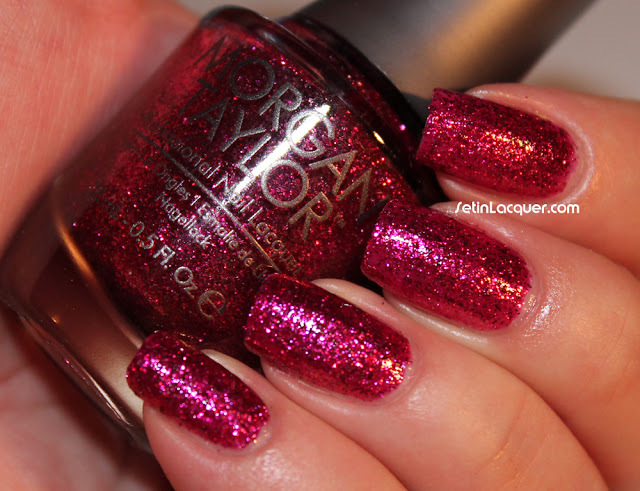 There are a few glitters of a pinkish color that simply adds to the overall look. This is similar to Bang but has more of a rosy look to it. The pink is more predominant. On the index finger I layered it over Zoya Purity; the middle finger is over Sinful Colors Unicorn; the ring finger is layered over Venique Orange Strap Wedges; and the pinky is three coats of Exploded by itself. I hope everyone is having a wonderful Memorial Day Weekend. The grills are smoking and the parties are endless as family get togethers and graduation celebrations commence. I have spent the majority of the weekend in the yard. But I do have a quick mani to show you. 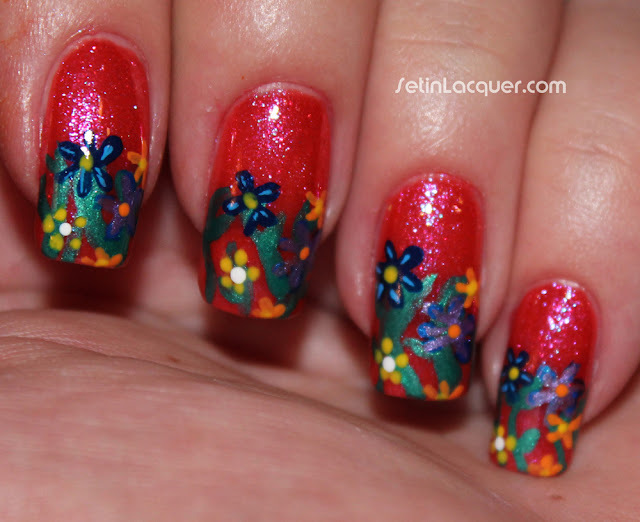 Traditional french tips with floral nail art. Traditional white french tips with floral accents are the spring look I was going for. I used Zoya Purity for the white tips. It has great opacity and the finish is perfect for a canvas for nail art. 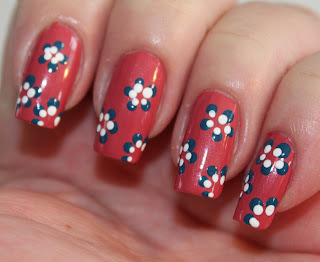 Then I used acrylic paint to create some simple flowers and add dots. Acrylic paints are wonderful for nail art. 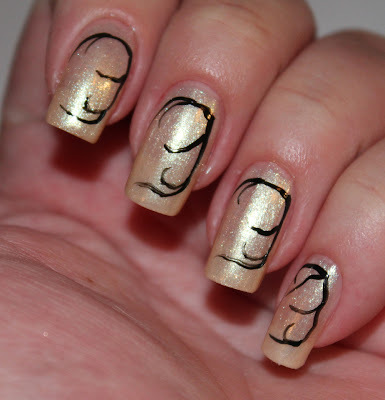 They have a great consistency and a drop or two stays workable for the entire manicure. If it does manage to dry out a bit you can mix a drop of water in the paint. 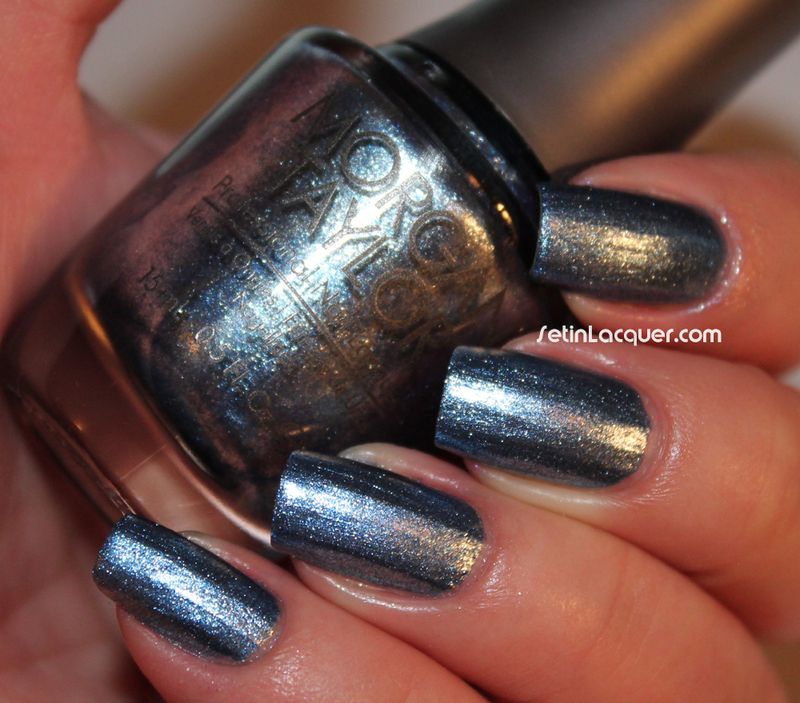 I have an exciting shimmer top coat for you today. Girly Bits Emerald City Lights is from her amazing "Spring it on me" collection. Emerald is the color of the year. I positively love shimmer top coats. It's like having an unlimited supply of colors in your polish stash. The shimmer changes depending on the base color you use. I used Zoya Song for a base color. Song is a gorgeous navy blue color. Something about deep blues and greens has always drawn me like a magnet. The combination of emerald and bold navy shades remind me of oceans and the tranquility of the deep waters. Look what happens to this navy polish when I use Emerald City Lights. It transforms into an even deeper emerald shade. The shimmer adds an amazing depth and dimension to the total look. The shimmer was difficult to capture and the color even more difficult. 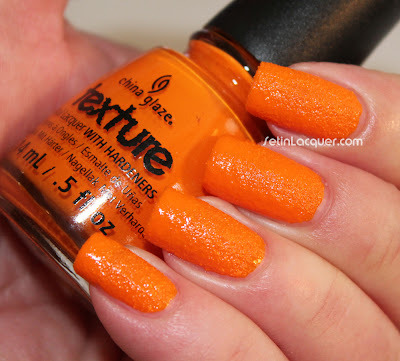 Textures are the current trend and China Glaze has introduced their line of textured polish. I received these polishes from China Glaze to share with you. These Texture polishes can add an element of dimension to your nails. Texture dries matte, but if you want a glossy finish you can add a top coat. It has a finish similar to that of a sugared rim of a luscious cocktail. The formula was great. Two coats provided complete opacity and the polishes dried fairly quickly. The texture wasn't too rough. It didn't snag on material or in my hair. It may sound strange but it was a smooth bumpy finish. 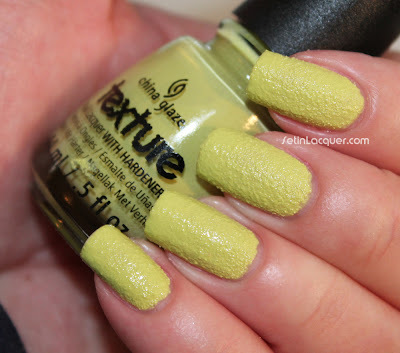 The swatches below are with two coats of Texture. Let's jump right in! China Glaze Textures - Of Coarse! China Glaze nail lacquers are available through salons and professional beauty supply stores in the U.S. For more information, please visit www.chinaglaze.com or follow China Glaze on Facebook (@ChinaGlaze), Twitter (@ChinaGlazeOfficial) and Pinterest (pinterest.com/chinaglaze). Transmit your acceptance of the paranormal by wearing these otherworldly Nail Varnishes. These 3 new shades and Top Coat not only offer a vivid burst of color in the normal world, but also glow under UV black light, revealing an alternative, paranormal effect unknown to the naked eye. I snagged all three of these polishes. I have only had time to swatch one of them for you as Spring had sprung here. Yard work and flowers have been requiring more of my time. But it was a good test for this amazing polish. This mani survived two days of digging in the dirt and planting 50 or more flowers and eight trees. I used two coats of Illamasqua Ouija for the base color and dotted Omen and Seance on in a scattered manner. The Seance really didn't show well though. Ouija is a phenomenal pink with amazing foil flaked shimmer. The formula on these is amazing. Wonderful even application and a quick dry time. I didn't use the Paranormal UV top coat though. Barielle Giveaway - Three winners! 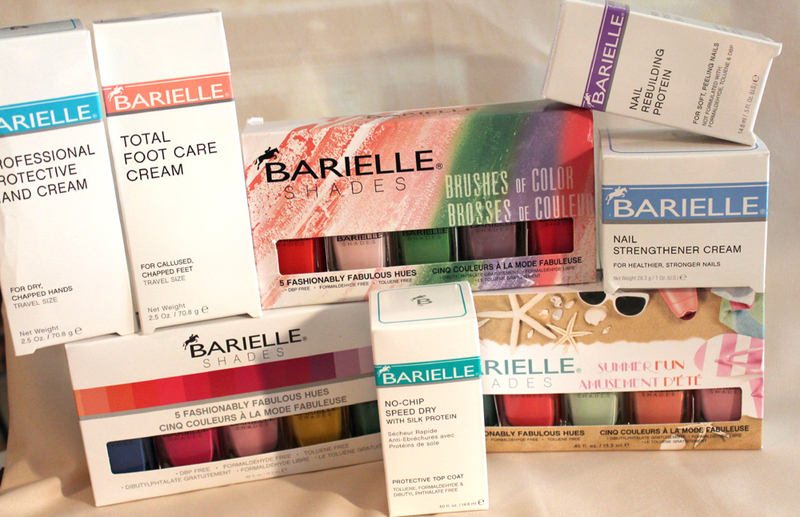 Barielle has been oh so generous and provided some amazing prizes for you to enter to win. I use Barielle quite often for nail art and it is a wonderful brand. Over 30 years ago, Barielle introduced "Nail Strengthener Cream" as the first nail care product of its kind. Originally formulated to condition the hooves of million-dollar thoroughbred racehorses, this legendary skin care product helps nails grow healthier and stronger while resisting splits, peels and breaks. Its effectiveness launched Barielle as a nail and skin care company with unique products and approaches to treating, protecting and maintaining nails. Barielle has since evolved into one of the leading prestige nail care, hand care and foot care brands sold in the world, known for our cracked feet treatments and the best moisturizers for dry skin." - Barielle website. One winner will receive the Summer Fun Collection. One winner will receive the Brushes of Color Collection. And don't forget to enter the giveaway from Barielle that has 11 winners! It ends May 31. The Giveaway will end at midnight on May 31. The giveaway is open internationally but check your countries regulations on polish. I am not responsible if the polish arrives damaged or is lost in transit. The time has flown by. It's Day Seven of the Seven Days of Floral Nail Art Tutorials. Today is glitter flowers. 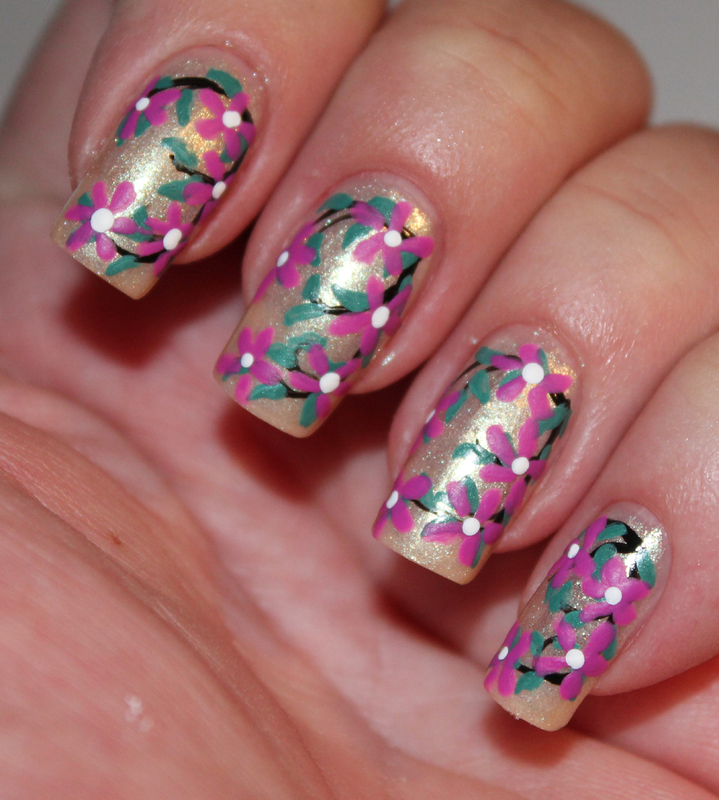 Simple flowers with a fun touch of a holographic micro glitter. I started out with Illamasqua Poke. It's a gorgeous shimmery deep purple polish. 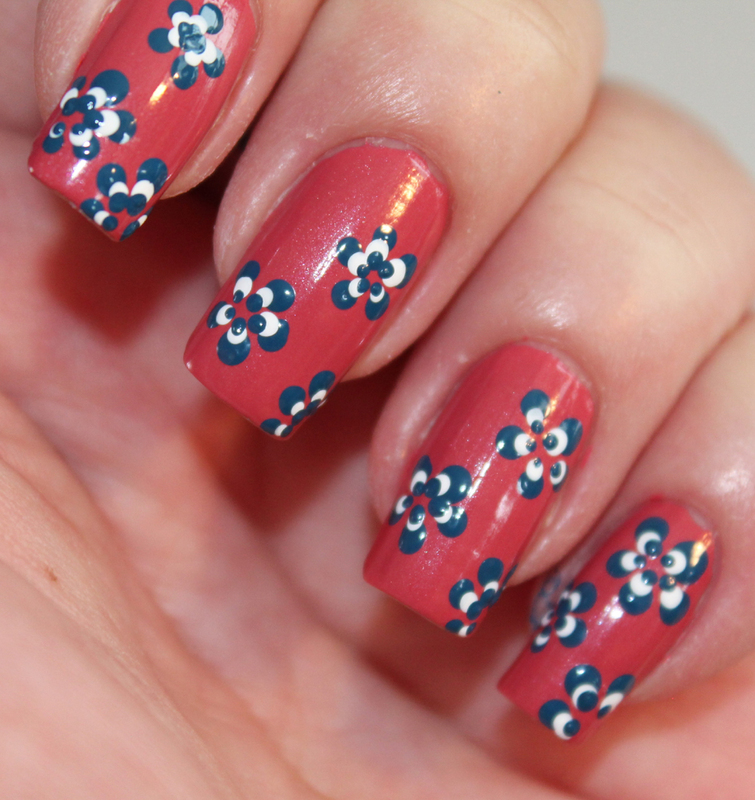 My mani was several days old before I added the flowers. 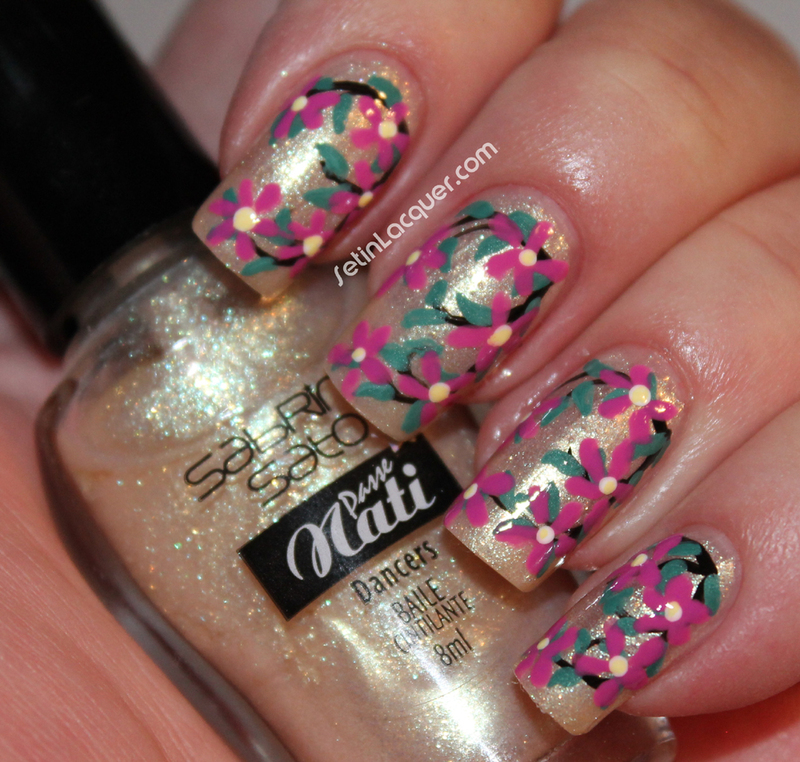 Nail art is a great way to spruce up a manicure. Then I used a lighter shade of purple acrylic paint to create flower petals and a dark blue for the flower centers. These flowers are super easy to create. Then I used Nicole OPI Make A Comet-Ment holographic micro glitter over the purple petals. It adds a flashy flair to the look. Have you used nail art to spruce up your current mani? What's your favorite method? 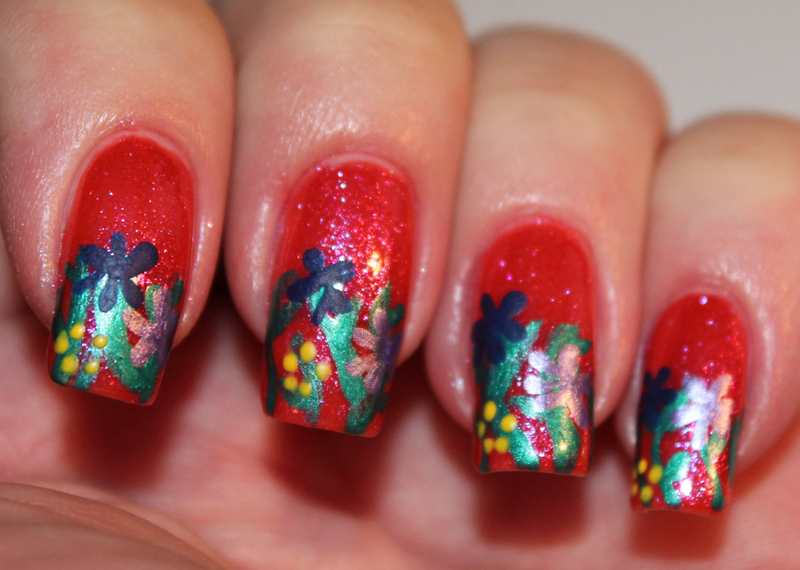 Well, The Seven Days of Floral Nail Art Tutorials are almost over. I have had so much fun doing this. Today is a fun Spring Garden. I wish the photos would show better but these are so shiny it was hard to capture. I used OPI Wing it for a base color. Oh My Goodness. This color is positively amazing. Two coats gave me great coverage. The shimmer and shine are completely stunning. Then I applied some stems and leaves with green acrylic paint. I used purple and blue acrylic paint to start adding some of the flowers. I used a combination of flower techniques in this "garden." 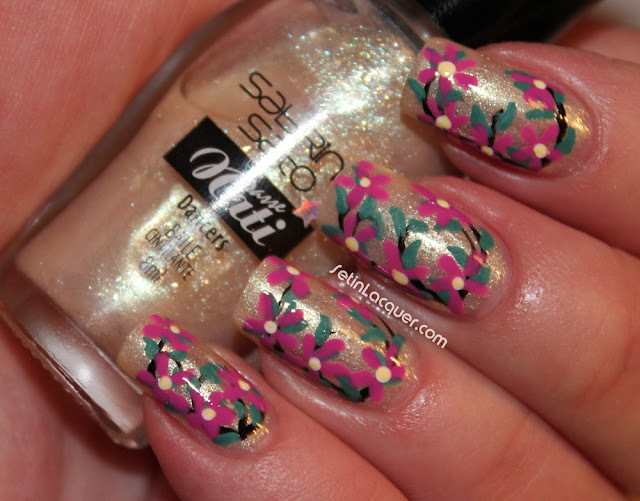 Dotted flowers with yellow paint add to the look. 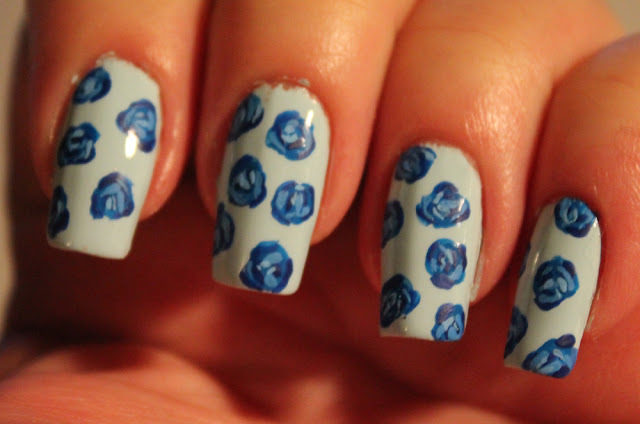 Lighter blue details on the blue flowers and white or yellow flower centers complete the design. It is so bright and cheery! What are you wearing on your nails? Do you use acrylic paint to create inspiring nail art looks? 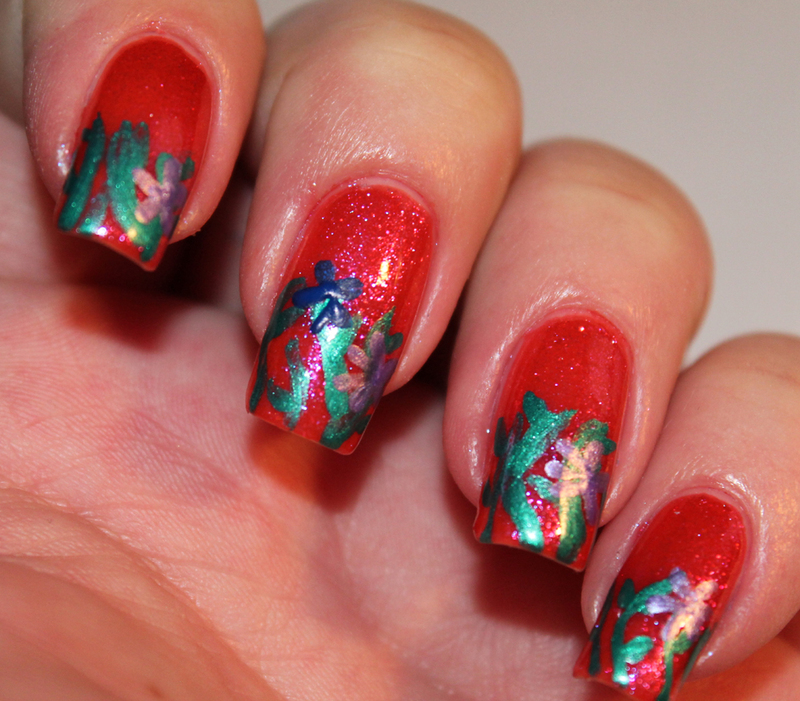 I have had fun with the Seven Days of Nail Art tutorials. Just a couple more days to go. For this one I did a simple dotted nail art floral design. I started out with a base color of Sheswai Ladylike from the 2013 Summer Collection. I love this dusty rose shade. It can easily be a one-coater! The design is truly a simple creation. 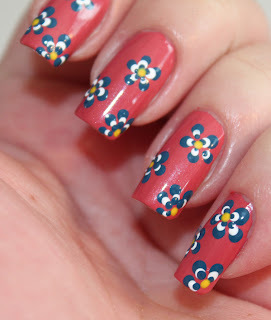 Use a dotting tool and create several circles of petals. This will be the main petals of your design. I used acrylic paint. 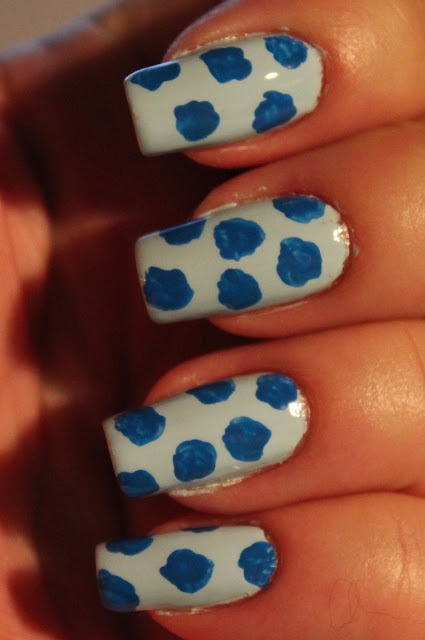 Use a smaller dotting tool and dot white dots on the inside part of the blue dots. 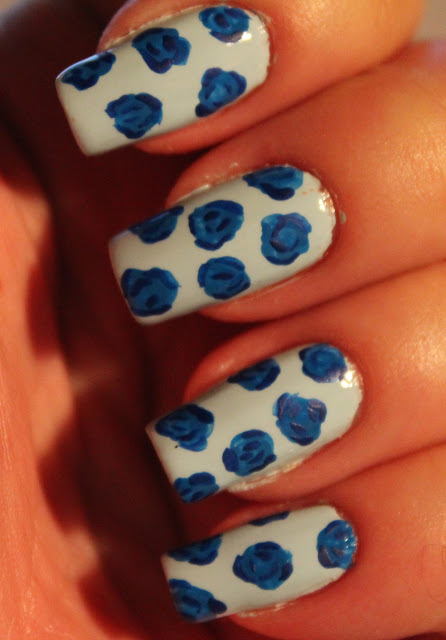 And with an even smaller dotting tool create an inner ring of smaller petals with the blue paint. I used a bright yellow dot in the center of each flower. Then I added some green leaves and some random dots to finish the look off. Flowers are so forgiving as nail art. So don't be afraid to go for it! 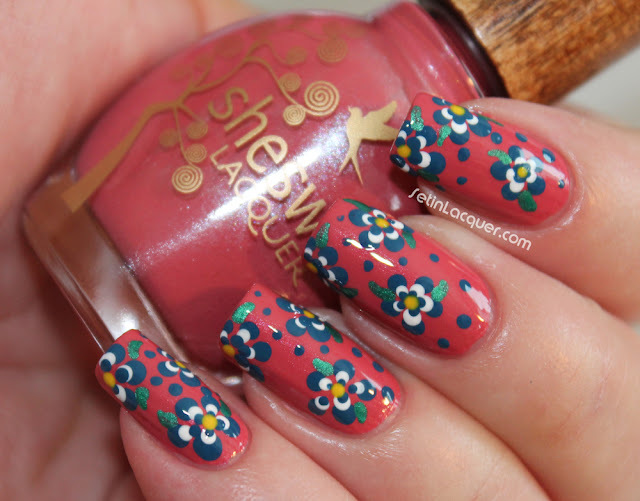 And don't forget to check out Sheswai lacquers. They have a wonderful formula. You can get them at BeautyPopShop.com. The Sheswai polish used above was sent to me for an honest review. All opinions are my own. First thing I have to say is Happy Mother's Day to all the amazing Moms out there! Being a parent is hard, but rewarding work. As I sit writing this I can smell the bacon and sausage coming from the kitchen. My husband is making his famous breakfast for me. It is going to be the start to a wonderful day. But I am off on a totally different topic now. 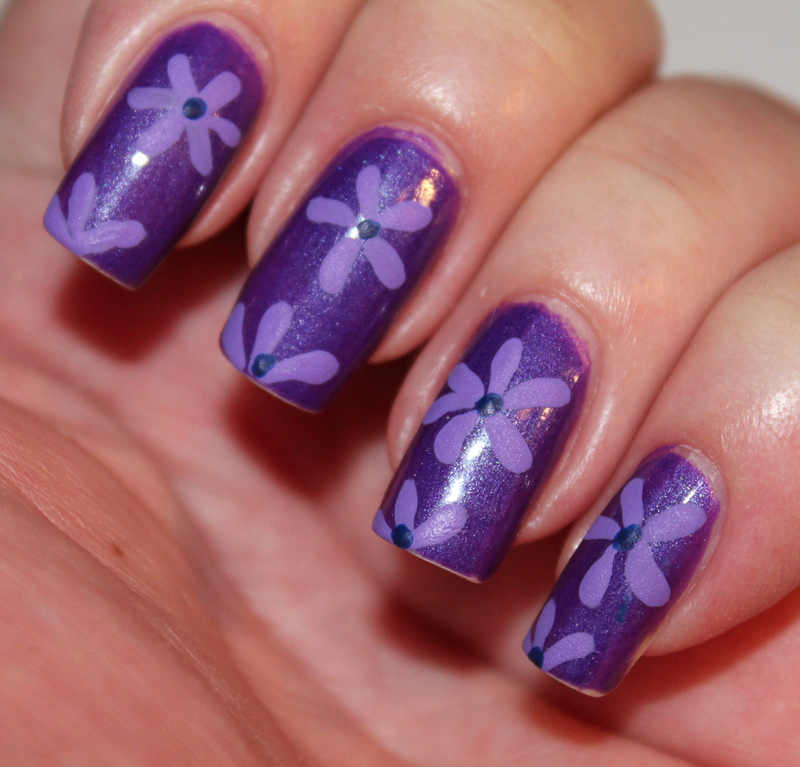 Day Four of the Seven Days of Floral Nail Tutorials is a fun, yet classy vine design with purple flowers. I used Sabrina Sato Ballet as my base color. It's a wonderful shimmery off-white polish that has strong gold tones. Then I used black acrylic paint and drew a "half circle" of vines on my nails. I probably added a little too much detail to the vines as you can't see all of them when I am finished. Then with green acrylic paint I added leaves to the vine. 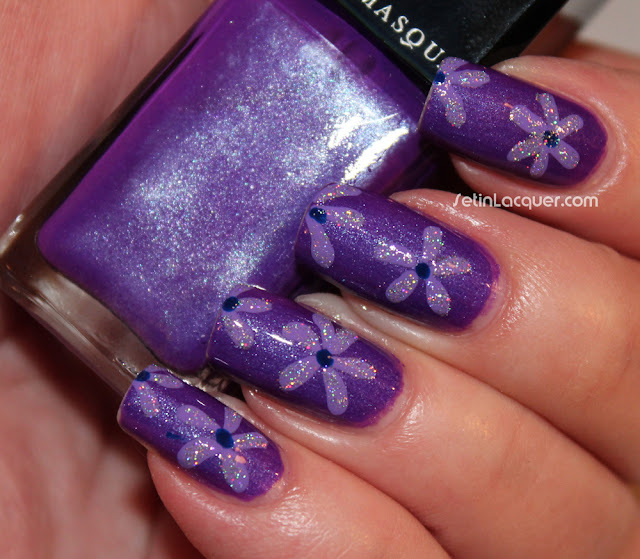 I used purple acrylic paint and added purple petaled flowers to the design. Then with white paint I added centers to the flowers. After the white centers I added some pale yellow to the centers because I didn't like the way the white was so - well white. There you have it. A wonderful fun and Spring manicure. Would you wear this? What color flowers would you want? Day Three of the Seven Day of Floral Tutorials - Everything is coming up roses! It's day three of the Seven Day of Floral Tutorials and I hope you are enjoying it. I know I am. Today everything is coming up roses! 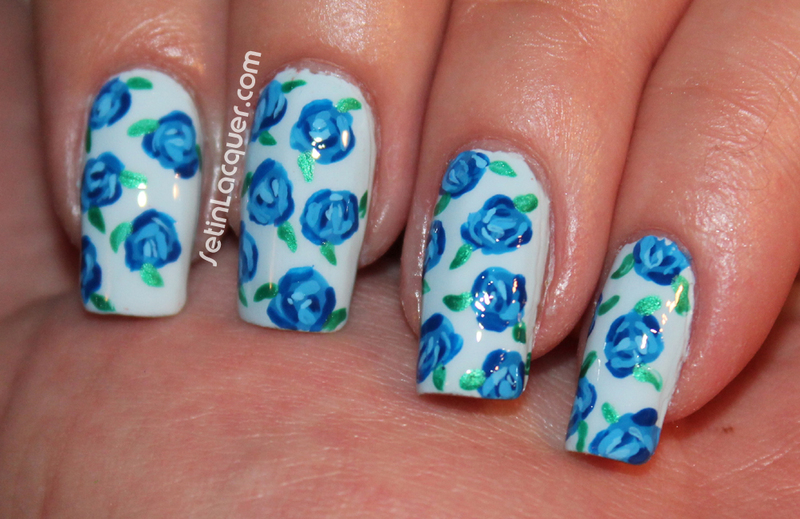 These sweet roses have a few steps but are actually quite easy and the color possibilities are endless. I started off with a base color of Zoya Blu. This soft pastel blue makes a perfect canvas for nail art. Then I used a MASH Nail Art Brush and added irregular shaped blue circles with medium blue acrylic paint. Using a darker blue acrylic paint partially outline the circles. Make sure not to outline the entire circle. Then go inside the line and add a few rounded lines. You are now started to add the detail and definition to the roses. 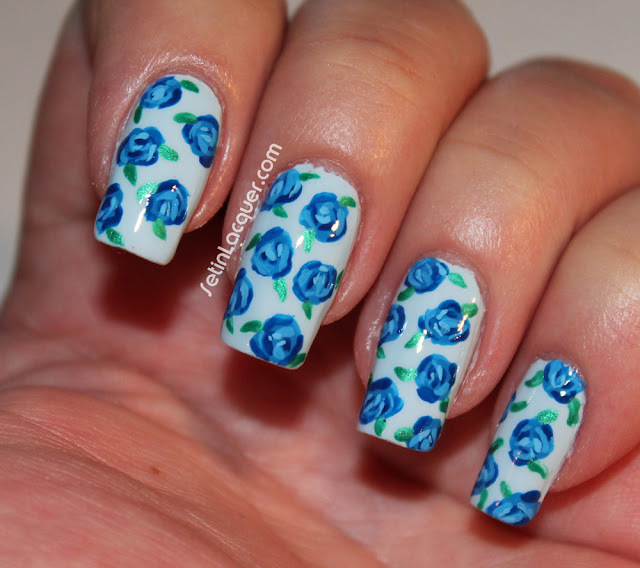 Use a lighter blue (or add white to your blue paint) and add even more definition to the roses by adding curved lines of the lighter blue paint. 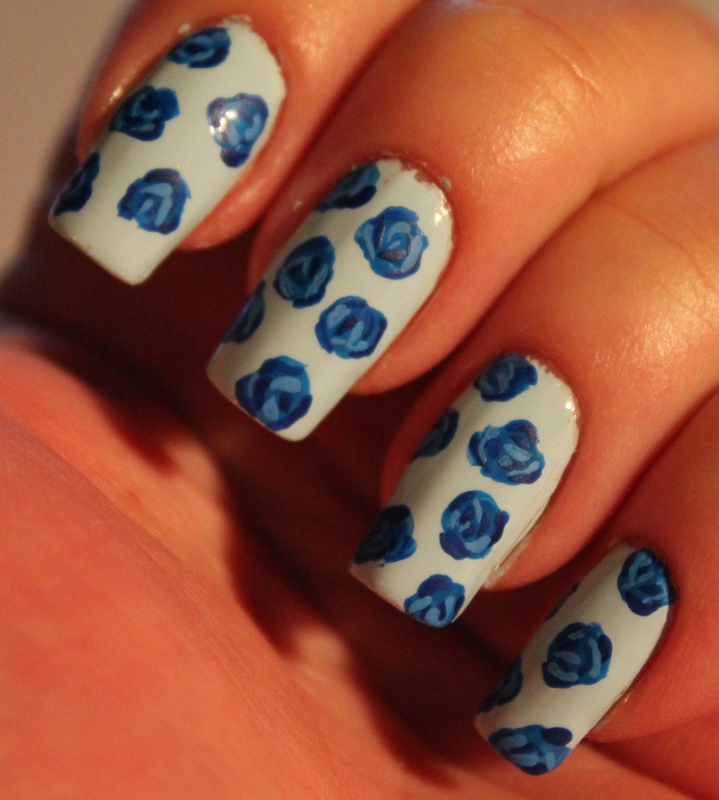 With an even lighter blue add some curved lines to the centers of your roses. Use a green paint to add the leaves. 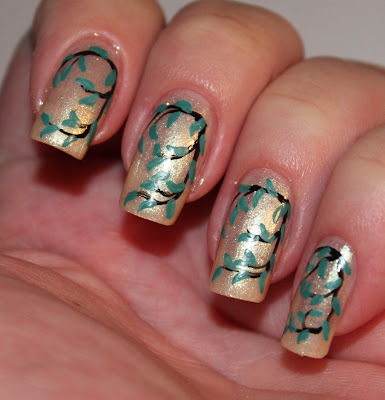 With leaves you just used a shorter nail art brush and push down on the nail, pull down, and lift up. Practice on a piece of paper if you want to first. Add a top coat to seal your nail art and add the shine. There you have it. Gorgeous nail art that really wasn't that hard. I hope you are enjoying this series. If there is anything else I can share feel free to let me know.